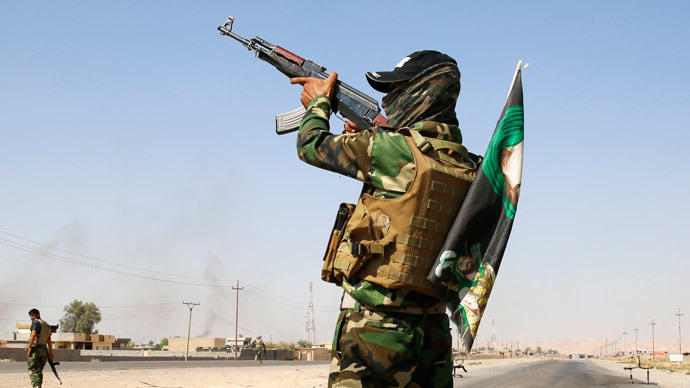 Shiite militias, according to witness reports, have killed at least 72 unarmed Iraqi’s. Onlookers said security forces stood by and watched as the massacre took place. The Iraqi government has launched an investigation into the claims. The alleged executions are said to have taken place in the village of Barwanah, near the town of Sinsil, which is in the east of the country and had fallen to Islamic State (IS, formerly ISIS/ISIL) militants during the summer. The massacre on January 26 followed a three-day offensive by Shiite militias and government troops, which had captured two dozen villages in the area. It would seem Barwanah has now been wrested from the control of the IS. Survivors of the ordeal say that Shiite militias were responsible as well as Iraqi security forces. Reuters, which exclusively reported the story, said it managed to speak to five witnesses who gave their versions of the claimed atrocities. The incident is believed to have happened on Monday afternoon when 10 Humvees arrived in the village of Barwanah, carrying men wearing black and brown uniforms, which are usually worn by Shiite militias and Iraqi security forces. There were also some civilians present amongst the group that arrived in the settlement, witnesses stated. Speaking to Reuters, Abu Omar mentioned how the villagers were dragged from their homes, regardless of their age. He mentioned the fighters took the men's mobiles and ID cards, then bound their hands, tying him to his 12-year-old mentally-ill son with rope. They did the same with his two older sons and three brothers. They were then taken to a field and were forced to kneel for around two hours, before some were led away to different spots in the settlement. There were over a hundred people present, witnesses stated. "They took them behind the wall. Less than a minute, then a gunshot," Abu Omar said. "All we could hear was the gunshots. We couldn't see." Another witness who spoke to Reuters said that the Iraqi government forces stood by helplessly and some were crying as the militias murdered the civilians. Another, Abdullah al-Jubouri, who hid in a pile of rubbish after seeing the Humvees approaching, said he saw soldiers and militiamen firing at lines of civilians – some of whom had their hands tied. "I saw them falling like domino pieces," he added. Abu Mazel, who also saw what unfolded, gave a very similar account, saying that he noticed some of the gunman were wearing green headbands, with the name ‘Hussein’ inscribed, who is an important figure in Shiite history. Mazel mentioned that he was forced to kneel along with his cousin. He heard others beg for mercy, as they were being dragged away to be killed. "My cousin raised his head, so someone slapped him," he said. "Five minutes later, they came and took him away and executed him." These accounts have been questioned by the Iraqi government and security forces, which say that IS forces could have carried out the killings. A spokesman for Iraqi Prime Minister Haider al-Abadi says the government will launch an investigation into the allegations. "The prime minister has ordered an urgent investigation and we are awaiting the results," said Rafid Jaboori, as reported by Reuters. "I don't want to come to any conclusions now. When the results of this investigation come out, we will have a full picture." A Sunni member of the Diyala provincial council said that at least 72 people had been killed, while another 35 were missing. In reply, a Shiite member of the same organization said that no one should jump to conclusions until the government’s investigation has been completed. "If it reveals that those men executed were terrorists, then we don't have any problem because in this case they got what they deserve," the Shiite council member told Reuters. "If the findings prove they were civilians, then justice should be done and those who did it must be arrested." Baranwah is located in the Diyala province, which borders Iran. The area has been plagued by violence for months, with IS fighting Shiite militias for control of the region, northeast of the capital, Baghdad. IS forces have carried out suicide bombings in the province, while Shiite forces have been accused of killing Sunnis in retaliation, Reuters reports. In August, at least 68 Sunni worshipers were killed in a mosque in the province, with a Shiite militia blamed for the attack, which was confirmed by an Iraqi security source. A month earlier, armed Shiite groups executed 15 Sunni Muslims and hung them from electricity poles in a public square in Baquba, according to Reuters.